AN-LAN-EXT-ENH-200-4 4 port Ethernet Extender is 4 port high-speed Ethernet transmission device. It can simultaneous transmit 4 port Ethernet over any 2-wire cable, such as Cat5, coaxial cable, telephone line, power line and so on. The Max transmission distancecan reach 1,000m, and the Max bandwidth can reach 200Mbps. The graph below shows AN-LAN-EXT-ENH-200-4 transmission distance and network data rate. The data differs from the cables types. When you use this device, please choose the suitable cables in line with your demands. The above data for TCP throughput is the measured data in the actual environment. The maximum physical layer data is 200Mbps. For coaxial cable transmission, performance is more stable, but it also affected by the cable and terminal matching methods. The above tests are all finished in the field test. 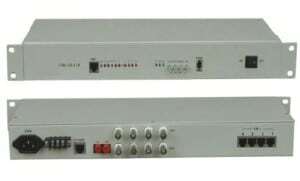 When 4 port Ethernet Extender connects Single Channel Ethernet Extender, Single Channel Ethernet Extender as receiver unit. 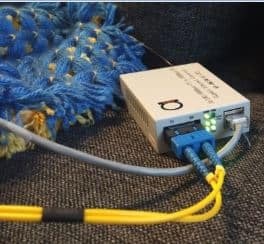 When 4 port Ethernet Extender connects 4 port Ethernet Extender, they are both installed at any side, local or remote, can be used. When you use AN-LAN-EXT-ENH-200-4, please follow the below tips as a reference, in order to reduce the fault in the process of using and the inspection work. The device supports auto-negotiation allocate master and slave. It also can be set master-slave side and grouped by software. Each group (one point to multi-point communications group) only allows one Master, others are Slaves. Otherwise, the network data won’t be able to transmit. Please choose matching power supply (12VDC / 1A). This device contains the Master and Slave Unit, which supports point to point and point to multi-point network transmission. Now it has two type terminals BNC and 2P connector for your choice, which can be directly used with coaxial cable or 2-wire cable. It can greatly simplify the project cabling, applied to expand network system and transmit long distance network device signals.